One of the most famous photos in the world is shown above. It was taken by Private H. Miller of the Civil Affairs Branch of the U. S. Army Signal Corps on April 16, 1945, five days after the Buchenwald camp was liberated by the Sixth Armored Division of the US Third Army on April 11, 1945. 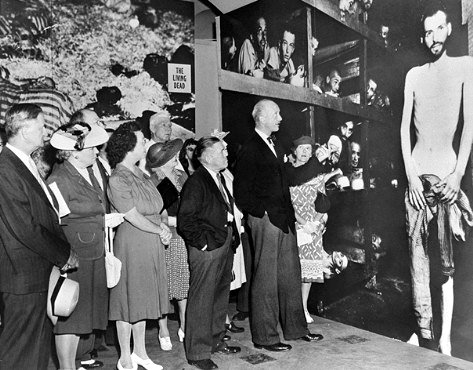 A traveling exhibit of huge, larger than life size photographs from the Nazi concentration camps, including Buchenwald, was first shown in St. Louis, MO in 1945 and then taken to Washington, DC. The photo above was taken in Summer — notice the white shoes. The world’s best known Holocaust survivor, Elie Wiesel, has identified himself as the prisoner whose face can be seen to the left of the post in the center of the photo above. In the photo above, the tall boy, the fourth from the front on the left side of the column of orphan boys, has also been identified as Elie Wiesel. Update Oct. 5, 2010: The boy in front of the tall boy wearing a beret has been identified as Elie Wiesel on this web site. I have blogged about this on a new post on my blog today, October 5, 2010. Elie wrote in his book “Night” that he became sick three days after the Buchenwald camp was liberated on April 11, 1945 and was in the hospital for two weeks. Elie’s father had died in Buchenwald, so he was an orphan. That means that he could be in the photo of the orphans directly above, but if he was in the hospital when the photo of Block 56 at the top of this page was taken, then he can’t be in the photo. In the book “The Children of Buchenwald” by Judith Hemmendinger and Robert Krell, there are the stories of 31 of the 904 orphan boys at Buchenwald, including the story of Elie Wiesel in Chapter 11. On page 113 of this book, it is mentioned that Block 66 was the barrack for the orphan boys at Buchenwald. Now look at the famous Buchenwald photo again. 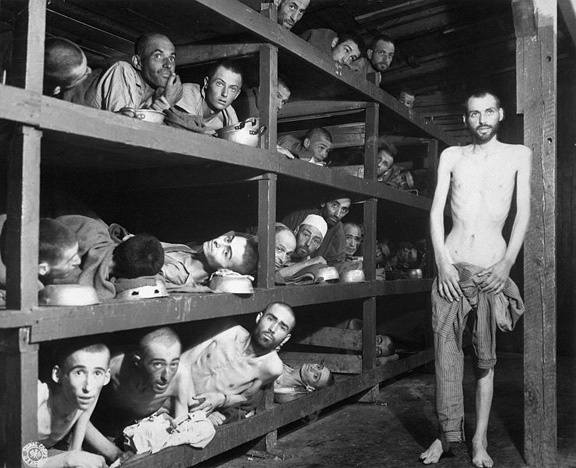 Holocaust survivor Miklos Grüner has identified himself as the 16-year-old prisoner in the lower left corner. In May 1944, at the age of 15, Miklos Grüner was sent to Auschwitz-Birkenau where he was registered and then transferred to the Monowitz camp to work in the I.G. Farben factories. 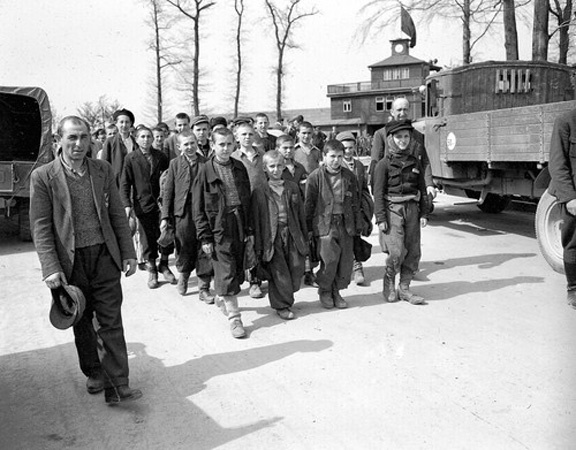 When Auschwitz-Birkenau was evacuated on January 18, 1945, Grüner joined the death march out of the camp, and was then taken by train to Buchenwald. His story parallels that of Elie Wiesel who was sent, at the age of 15 and a half, to Auschwitz-Birkenau, then sent to work at Monowitz. Elie and his father also joined the death march, and wound up in Buchenwald, where his father soon died. So Miklos Grüner and Elie Wiesel were both orphans who should have been in Block 66, the orphan’s barracks, but they somehow got in a photo taken in the adult barracks. Grüner was suffering from tuberculosis and had to be hospitalized in Sweden after he was liberated, so why wasn’t he in the TB ward? Sick prisoners were usually isolated, sometimes in a separate camp, but at least in separate barracks, so that they wouldn’t spread diseases like tuberculosis. 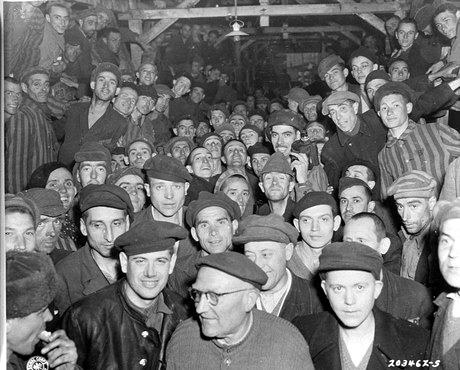 The prisoners in the photo directly above are in Block 56, which was an adult barrack in the “Small Camp” at Buchenwald. The Small Camp was a special quarantine section for prisoners, mostly Jews, who had recently arrived from other camps, such as Auschwitz-Birkenau. Elie Wiesel and Miklos Grüner were both Jewish and both had probably been put into the Small Camp upon arrival, but since both were orphans, both of them were probably put into Block 66. So what are they doing in this photo of Block 56? 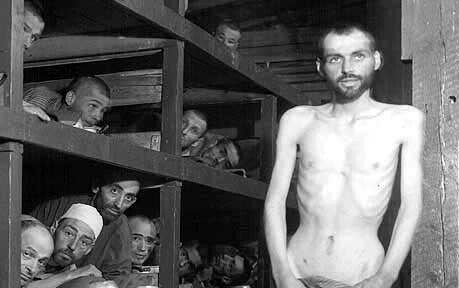 The photo above shows a barracks full of Buchenwald survivors who appear to be in good health. Contrast this with the photo of prisoners in Block 56. There has been a lot of talk and blogging recently about an accusation that Miklos Grüner has made against Elie Wiesel. Grüner claims that Elie stole the identity and the tattoo number of another prisoner, and that Elie was never at Auschwitz, nor Buchenwald. Anything is possible. There were allegedly 750,000 Hungarian Jews and only 437,000 of them were sent to the Nazi concentration camps in 1944. Elie wrote in “Night” about a woman who offered to hide the Jews in his home town, but they all refused. Could it be that Elie and his family actually went into hiding and were never sent to any camp? Could Miklos Grüner be right — or is he just jealous because Elie Wiesel has made a fortune out of being a Holocaust survivor? The Buchenwald Memorial Site has all the records of prisoners who were registered in the Buchenwald camp, and according to the Holocaust revisionists, there is no record for Elie Wiesel. If that is true, shouldn’t the staff of the Memorial Site speak up and settle this once and for all? why don’t people look at the bigger picture. If his story is true, he clearly has felt an immense amount of pain in his life and does not deserve to be hurt again. specially in an accusation such as this. You can’t even imagine how it would feel to be accuse of lying about something that took much courage to be able to share. If it is false, so what, his story has still touched millions of people. Fiction or not. If it didn’t happen to him I’m sure it happened to someone. There are hundreds of stories about the holocaust that aren’t true. Elie is an incredible writer and his words have touched me dearly. He was in block 56 at first because his father was not dead yet. he was not an orphan just then. he also claimed to be older in the beginning of the whole thing. he was transferred to block 66 after his father died. he was n the adult block at first because he claimed to be 18 when he was registered at the very first camp. The photo was taken on April 16, 1945; according to Elie’s account in “Night,” his father had died long before this, so Elie would have been in block 66, the orphans block. In his book, Elie says he claimed to be 18 when he went through the selection process at Auschwitz because one of the Jewish prisoners whispered to him that he should claim to be older so that he would be selected to work. At Buchenwald, there was no selection process, so he would have given his real age, which was 16 and a half, since he was born September 30, 1928. In his book, Elie said that he got sick three days after Buchenwald was liberated, so he was in the hospital on April 16, 1945. To answer your question of why sick orphans were in the regular barracks … maybe this was the Tuberculosis barracks and that’s why the prisoners are so emaciated, but the U.S. military wanted to show this as the regular conditions of prisoners. Or maybe they asked some sick, skinny prisoners to come into the barracks for the picture. Notice how they have the one very thin man standing there showing off his starved body, and another one (in the same bunk as Myklos) edging himself out to show off a bony chest. As you said, anything is possible. As you said, the prisoners they packed into a barracks for the other photograph look very healthy, and they absolutely were not all living in that barracks. They were gathered there for the photograph. It’s called getting the kind of publicity shots you want. This could be the Tuberculosis barrack, except that Elie Wiesel did not have TB, as far as I know. There is no question that the skinny man was posed for this picture. In the 40s and 50s, it was considered bad form to pose people in what was supposed to be a candid shot. This photo is definitely disingenuous. Paulo is funny. He claims to “know” something he can’t possibly know. If you zoom up to 200 or 400% and look at the two faces that Elie Wiesel has identified as his own, it’s obvious that they are not the same person. The “Elie” in the barracks does have a resemblance to the Elie Wiesel we know, but that doesn’t mean it is he. The Elie in the photograph looks too old to be 16 years of age. The “Elie” walking with the group of orphans doesn’t look anything like the Elie Wiesel of today, but again, people can look different from one photograph to the next. But that different?! Also, this boy is very tall; is it because he’s older than the others? I don’t have the impression that the real Elie Wiesel is particularly tall. When he was at Buchenwald with Pres. Barack Obama last summer, he was noticeably shorter than Obama, and Obama is not exceptionally tall. Can anyone say how tall Elie Wiesel is? Do you see any resemblance at all between that boy in the photograph and Elie? Dr. Kenneth Walzer claims to have checked it out and corroborates that Elie was there. I find that very strange. What was his corroboration based on? Elie Wiesel was 16 and a half when the photos were taken and Miklos Grüner was 16. Out of the 904 orphans at Buchenwald, only 30 were under 13 years of age. Some of the so-called orphans actually had at least one living parent. The tall boy in the photo of the marching orphans is wearing a black cap. Notice how many of the prisoners in the photo of the healthy survivors are wearing black hats instead of the standard striped cap. The black hats designated the Communists who more or less ruled the Buchenwald camp; they were captured resistance fighters, for the most part. Buchenwald was the main camp for French resistance fighters. Elie Wiesel is definitely in the photo, I believe he is eight counting from the left. His face is partially obscured; but if you compare it to a photo of him as a youth, it is the same person.